I love the time of year when everything turns purple. The heather is starting to show and almost in full bloom in some areas, the wild croscosmia is going to be out in the next few weeks and the water lillies are in full swing in some of the lakes and tarns of Snowdonia……time to get out with the camera again. 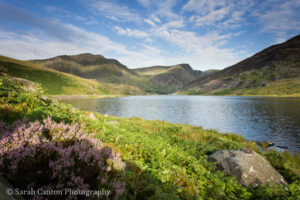 Image of Y Garn and Foel Goch taken this weekend from Llyn Ogwen! This entry was posted in Latest images.